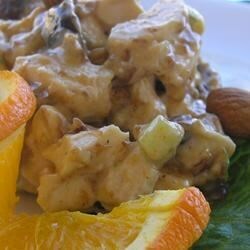 "A quick and easy fruit and curry chicken salad. . . Other items may be added as desired, e.g., raisins, pineapple, coconut, nuts of your choice, green onion, etc." In a large bowl, whisk together the mayonnaise, chutney, curry powder, lime zest, lime juice and salt. Add chicken and toss with the dressing until well coated. Add more mayonnaise to taste, if desired. Cover and refrigerate until serving. Have made this salad a number of times using your options by adding a large can of pineapple tidbits and toasted sliced almonds. Great meal on a hot evening. excellent recipe. I added some yellow raisens. I bet this would be great with hard boiuled eggs too. My husband really enjoyed this. Added some sliced seedless red grapes and slivered almonds. Used leftover roast chicken from Sams Club. Great recipe, even better the second day. Like other reviewers I added and handful of golden raisons for a little sweetness. My picky 9 year old even liked it. Delicious! A refrshing change of pace!